Yet this, of course, is exactly what has happened. These are complete game-changers in terms of America’s position in the world and its trading relationships. Over the decades following World War 2, Republican and Democrat Presidents alike saw trade as the key to avoiding further wars by building global prosperity. Presidents Reagan, Bush and Clinton all actively supported the growth of global trade and the creation of the World Trade Organisation (WTO). The US also led the world in environmental protection following publication of Rachel Carson’s ‘Silent Spring‘ in 1962, with its attack on the over-use of pesticides. Trump’s policy is instead based on the idea of bilateral trade agreements with individual countries, with the US dominating the relationship. Understandably, many countries dislike this prospect and are instead preferring to work with China’s Belt & Road Initiative (BRI, formerly known as One Belt, One Road). 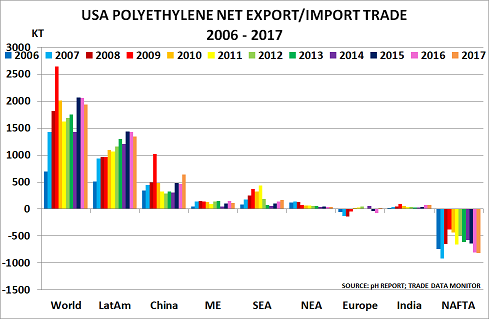 US polyethylene (PE) producers are likely to provide a case study of the problems created by the new policies. They also caused anguish in traditionally pro-American countries such as the UK – adding to concerns that he has lost his early interest in the promised post-Brexit “very big and exciting” trade deal. 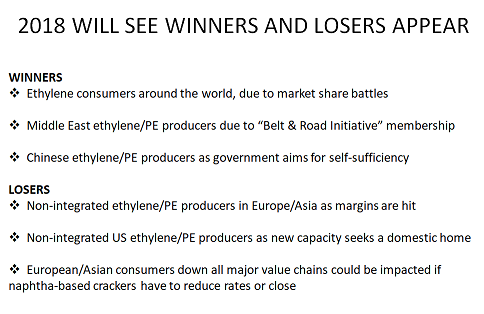 US companies were already facing an uphill task in selling all their new shale gas-based PE output. The President’s new trade policies will make this task even more difficult, given that most of it will have to be exported. 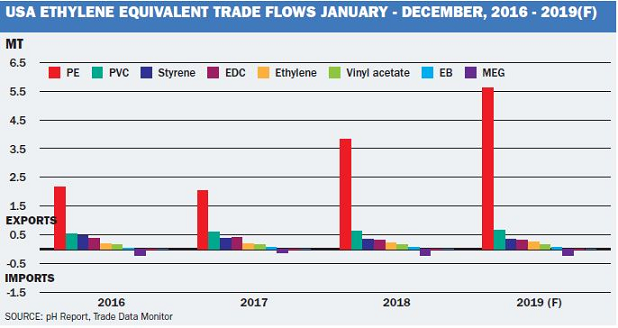 The post US PE exports on front line as Trump changes trade policies appeared first on Chemicals & The Economy. I spent most of last week in New York and Boston, meeting with major investors. One key topic on all their agendas was the major downturn underway in the global mining industry. 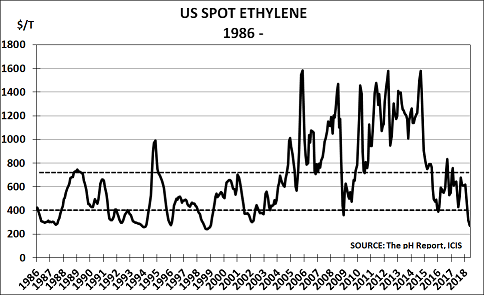 The connection with my visit was that some have already begun to worry that the planned US ethylene expansions may lead to a similar outcome. “It is a pretty tough market. The news from China hasn’t been good . . . It has deteriorated more than we expected and we think it is going to be tougher in the next six months“. Investors are also worried that many of these investments are apparently proceeding without the security of signed off-take contracts, backed by major bank guarantees. 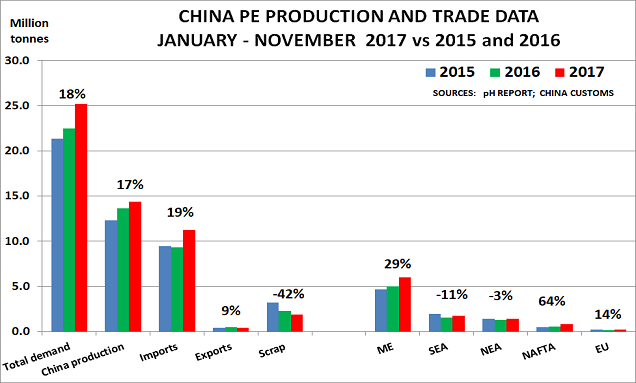 This also mirrors developments in the mining industry, where euphoria over the outlook for China was the key driver. These concerns are now being brought into sharp focus by the renewed weakness in crude oil prices since the Iran nuclear deal was finalised. 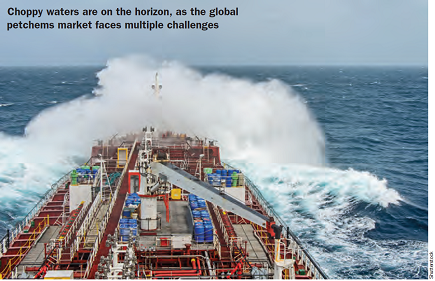 Investors are now concerned that if this decline continues, a return to lower oil prices could remove today’s US cost advantage versus other regions. China’s stock market collapse adds to their concern. These developments highlight the way that investors’ rose-tinted glasses led to them falling in love with the shale gas story, just as they had with mining. They had encouraged both industries to expand by bidding up share prices for the companies involved, and rushing to provide the necessary finance. Now they are realising, too late, that different Scenarios were also possible. There is, of course, no easy escape from the current commitments, given the up-front costs that have already been incurred. But the example of the mining industry suggests cancellation may well end up being the lowest cost option in the long run.